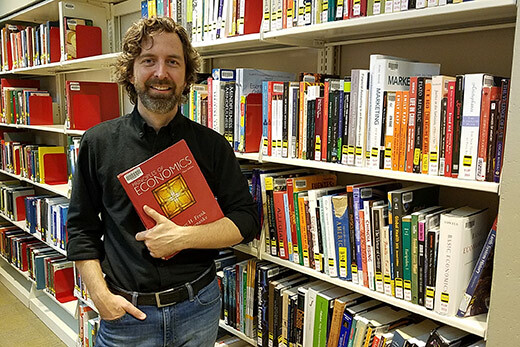 Course reserves coordinator Colin Bragg manages the FLIP textbook collection, which includes about 450 textbooks and other class texts, now housed in the Woodruff Library. Wondering what to do with textbooks as the semester draws to a close? Consider donating them to help other students. Emory’s First-generation Low Income Partnership (FLIP) developed the FLIP Lending Library in 2016. The FLIP collection depends on textbooks donated by students. FLIP participants — students who have a demonstrated financial need — are able to check textbooks out from the collection for an entire semester. Emory Libraries reserves coordinator Colin Bragg manages the FLIP collection. Woodruff Library Access Services team leader Amy Boucher mediated the partnership this past spring semester, and along with past FLIP co-president Min Young Park 17C and Bragg set up the parameters of the program. The student-led organization previously maintained its lending library at the Dobbs University Center (DUC), which has since been leveled to make way for the new Campus Life Center. Last summer, Bragg and reserves assistant Joelle Danz worked to bring FLIP’s books from the DUC to the Music & Media Library, which now houses them as part of Woodruff Library’s reserves collection. There are about 450 books in the FLIP library, including some novels and other non-textbooks, and FLIP hopes to expand the collection with increased donations. These books are available only to FLIP participants. To find out more about the FLIP Lending Library or other ways to get involved with FLIP, send an email to emoryflip@gmail.com or visit the group’s Facebook page.